Purified natural clay is blended with bismaleimide, 4,4’-bismaleimidodiphenyl methane (BMIM), in three different ratios (1, 3 and 5%) in acetone ultrasonically. Natural clay (3%) is intimately ground with BMIM. The pure BMIM and its clay blends are thermally cured at 250 °C for 10 h. FTIR results reveal that the clay particles do not have any strong interaction with the BMIM. 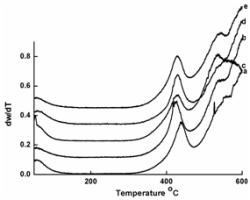 Presence of clay particles in the thermally cured BMIM affects the onset temperature of the primary thermal degradation. The degradation kinetics for the initial degradation stage of the materials is performed by Flynn-Wall-Ozawa method. The trend in the variation of the activation energy for the degradation of BMIM is not much affected by the natural clay particles incorporated in BMIM. But the presence of clay particles affects the activation energy for the thermal degradation process of cured BMIM. The way in which the clay is blended with BMIM also influences the degradation behavior of BMIM. The uniform dispersion of clay particles in BMIM is confirmed by SEM analysis.